Gravity is an attracting force, Gravitational force is always attractive in nature and is one of the weakest force. 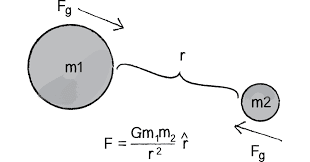 In this chapter,we will be studying about the gravitational force in detail. 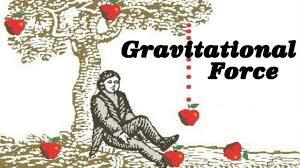 Newton's universal law of gravitation. Do you know that every object in the universe attracts other object!!! and when there is a attraction there must be a force which is being used to help objects attract each other. According to Newton's law of gravitation, every object in the universe attracts every other object with a force which is directly proportionate to the product of the masses of the objects and inversely proportionate to the square of the distance between the centres of the 2 objects. Gravitational force is a very important force and has many importance. The force of attraction that binds us to the earth. The motion of planets moving around the sun. The motion of moon around the earth. The occurring of tides due to sun and moon. It is the acceleration which a body experiences, when it falls towards the earth due to earth’s gravitational pull. It is denoted by 'g'. Its value is different at every place on earth. we usually take its value as 9.8 m/s2. 'g' does not depend on the mass of the object. The value of 'g' on moon is 1/6 the value of 'g' on Earth. As a result a object weighs 6 times more on earth. Value of `g’ is different on different planets, so weight will also be different. Weight of a body decreases with height and also with depth from the surface of the earth. It is the acceleration which a body experiences when it falls towards the earth due to earth’s gravitational pull. It is a universal gravitational constant. Its value is different at different points on the earth. The value of G=6.673 x 10-11 Nm2/kg2 . Its value can be zero—at the centre of the earth or in space. Its value can never be zero. The earth is not spherical in shape but it is oval in shape due to which the value of 'g' is more at poles. Value of g decreases with the altitude above the surface of the earth . Value of g decreases as we go deep into earth. For a freely falling body, u=0 at the maximum height. When a body is thrown up, its v=0 at the maximum height. If a body thrown up, g= - 9.8m/s2. If a body thrown down, g = 9.8m/s2. It is the quantity of matter in an object. It is the force by which an object is attracted by the earth. Its value remains same everywhere, as it is a constant. Mass is measured by a beam balance. Weight is measured by a spring balance.